Commercial media have faced product and price challenges in 2-sided markets for more than a century, but are encountering greater difficulties in getting it right as they try to effectively monetize multi-sided markets. 2-sided and multi-sided markets are ones in which more than one set of consumers must be addressed and there is an interaction between strategies and choices for each set of customers. Prices for one group of consumers affects their consumption quantity and this, in turn, affects the prices for and consumption by the other groups. Optimal revenues can only be achieved by dealing with all groups of consumers simultaneously. Newspapers are a classic example of 2-sided platforms. The first product is the content sold to audiences and the second is access to audiences that is sold to advertisers. This has been the basis of the mass media business model since late 19th century and the strategy has been to keep circulation prices low to attract a mass audience and then to make the majority of revenue from advertiser purchases. 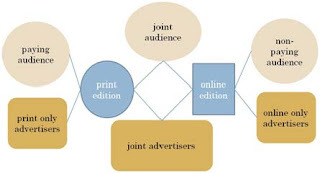 In this model, success in selling the newspaper product affects ability to sell advertising access because more readers makes a paper more attractive to advertisers; conversely, success in selling advertising affects ability to sell the newspaper to readers because it provides resources that improves content and make the paper more attractive. Getting prices right in this model is crucial, but most media have traditionally been relatively unsophisticated in setting prices. Few have used demand-oriented pricing, based on what the market will bear, or target return pricing based on achieving a specific rate of return. Instead most have set prices based on what the closest competitors are doing or on industry average price. They were historically able to get away with it because elasticity and price resistance were relatively low because of the near monopolies of past in many markets. Today, however, product and price choices are getting much more complex because of rising competition and because media are shifting from 2-sided to multi-sided platforms in which relationships among consumers are compounded. This complexity is evident in the difficulties newspapers and magazines are having figuring out effective ways to provide and sell content online. The problem occurs because there are paying audiences and advertisers for the print edition; free audiences and paying advertisers for the online edition; and some joint audience and advertisers who use both the print and online offerings. 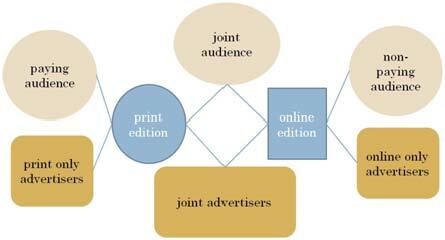 If one alters the free price online to create a paying audience, it not only affects the willingness of online advertisers to pay, but affects the willingness of joint audiences and advertisers to pay and thus effects performance of the print sales as well. Creating the correct combination of content available in print and online, getting the content prices right, generating audiences in both places that are right for advertisers, and properly prices advertising is no mean feat. The situation is made even more difficult as publishers add eReaders and mobile services to the mix. Those who think they can easily monetize newspapers, magazines, or other information products online ignore the significant challenges posed by multi-sided platforms and need to carefully consider the impact that these factors have on product and price choices.